QuitKick Total Stall System stops horses from kicking the interior walls of their stalls. This is the new Quitkick. It is an adaptation of the original QuitKick and is designed to stop horses from kicking the interior walls of the stable. It differs from the Quitkick Door Kicker in that the sensors are not part of the unit that sprays the water. With the Total Stall System the sensors are separate and they are attached to the wall where the horse is most prone to kicking. 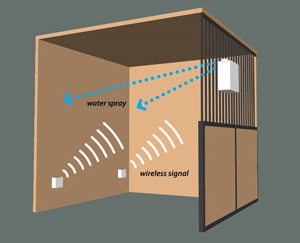 When the horses kicks the wall the sensors immediately send a wireless signal to the main unit and that instantly sprays water at the horse. Like the original QuitKick it is quick and easy to fit and totally painless. It is also 100% effective. If you have a stable with grills/bars along the front your equipment will come with a backplate which attaches to the bars and allows the water to spray into the stable between the bars as depicted on this page. As with the door kicking deterrent the unit will only active if the walls are kicked. General rubbing or leaning against the wall will not result in the horse getting a spray of water. I have been meaning to write for a while now. Our experience with your Quick Kick device has been extraordinary! The barn owner and manager were both highly skeptical at first, but within a day or two my mare's stall kicking ceased completely! Interestingly the water stream hit her blanket, not her bare skin, but the effect was still the same. She now stands on both hind legs equally while eating her grain. Once in a while she'll lift a leg and swing it, but not contact with the walls. Wish I had gotten this machine months ago. It would have saved me hundreds in vet bills! As an equine massage therapist, I will heartily endorse your product to my clients. It is highly effective and humane behavior modification. Can't say enough good things about it!